be a great solution for those who are always in motion, or for those who can’t live without their phones and useful apps. Many of us (I’m no exception) use apps to lose weight, improve health or boost career. This year I did a little research and found out 8 fantastic Christmas apps that you may want to start using right now. One of the instant ways to boost your Christmas spirit is to read Christmas stories. While you can grab some Christmas book and read your favorite stories, do you really want to read that book at work? 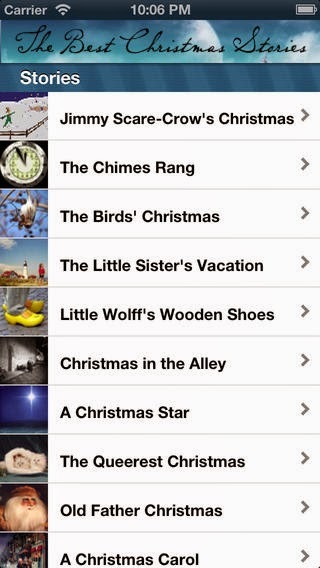 The Best Christmas Stories app is universal since it can be used on iPhone, iPad and iPod. The app has lots of interesting Christmas stories for the whole family. Folk and fairy tales by the Oliver Thorne, Charles Dickens, Hans Christian Andersen, Freeman, Lincoln, Miller, Lane, Elizabeth Harkison, and many more with full text search.